Countries from all around the world shared Turkey's sorrow and strongly condemned Sunday's violent terrorist attack by the PKK in the town of Dağlıca in southeastern Turkey which killed 16 soldiers and heavily wounded six. In a statement, the French Foreign Ministry denounced the "terrorist attack claimed by the PKK against military vehicles in the southeast of Turkey" and offered condolences to the families of the victims as well as France's "solidarity with the Turkish authorities". In a press release issued by Macedonian Minister of State Furkan Cako, the vicious terrorist attack was also "strongly condemned". In the statement it said that such incidents not only affected Turkey itself, but also many other countries as Turkey's cultural boundaries and emotional bonds extended far beyond its physical borders. Emphasizing that Macedonian Turks see Turkey as their "homeland", the statement added that terrorism will not prevail in Turkey, and that such violent attacks will not disrupt the peace and stability in the country or in the Balkans. 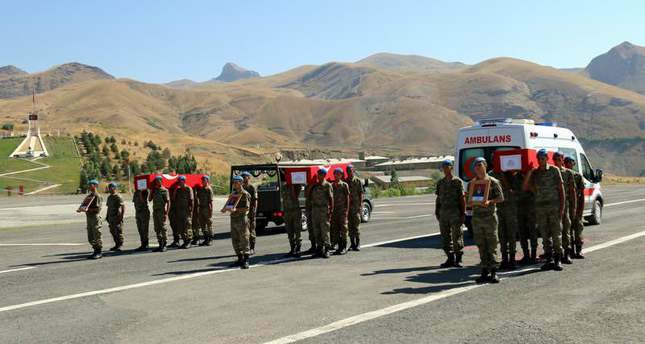 Cako, who is of Turkish origin, offered condolences to the soldiers' families and the Turkish nation. Albanian lawmaker Shpetim Idrizi said in a statement: "On the nature of this event, I want to state one more time that the nation of Albania is with Turkish nation." Foreign Ministry spokesman Glevin Dervishi also strongly condemned the attack. The deputy president of Montenegro's national assembly, Sulyo Mustofic, described the attack in Dağlıca, Hakkari province, as an act of terrorism designed to weaken Turkey. Serbian Mufti Muhammed Yusufspahic decried the attack on a peaceful, developing country. "Now there are people who want to hinder this development," he said. The head of the Green Crescent Society in Bosnia, Reco Causevic, offered his condolences and support as well. In Ankara, the Pakistan embassy released a statement in which is said it "condemns every form and manifestation of terrorism". The statement added: "We are with the families who lost their relatives in our prayers and sentiments. Sunday evening's attack saw 16 soldiers killed and six injured when their armored vehicles were targeted by roadside bombs planted by the terrorist PKK organization, according to the Turkish military.